The area is popular for snorkeling and diving. This is our guests' favorite part of Krabi. Wat Kaew Korawaram is 400 m from Sleep Well Hostel, while Chaloem Rattanankosin Stadium is 900 m away. The nearest airport is Krabi Airport, 13 km from the property. 2. Check in from 14:00 to 22:30. 5. Age restriction: 8-50 year old. Clean and very friendly staff. Can't complain!! The people who run the place are brilliant. Very friendly and helpful. Beds are very comfortable and there is a curtain so you can have privacy. The owners were really helpful and lovely. Had a really nice stay here and would recommend to anyone. Perfect location, walking distance to town, night markets etc. Amazing hostel, I loved staying here! It is not a social hostel at all, but if you want a place which is quite then it is perfect! The beds are really comfy and very big with curtain, night lamp and power plugin at the bed. The storage locker can fit a whole backpack and the ac in the room is good. The place is very clean especially the bathrooms and the breakfast in the morning is great with fresh fruit, bread, juice and coffee/the. Would defiantly stay here again, they are so welcoming! This hostel was perfect for what we needed - one night in Krabi before heading to Koh phi phi. 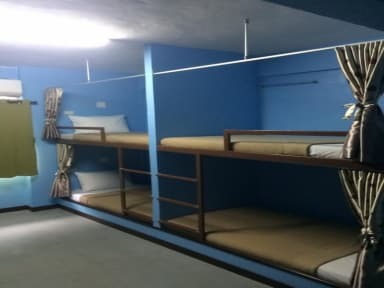 As other reviews have said there isn't an atmosphere to this hostel. There were 3 bathrooms (with showers) on each floor, plus a large counter/mirror and sink in the hall. 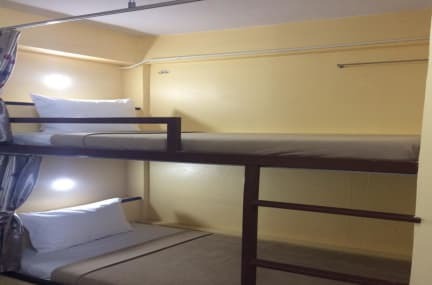 The dorms were awesome... the bunk beds were built-ins - with hooks (HUGE BONUS) & providing a ledge on the wall side for your phone, an outlet and a little reading light. Breakfast is included - bread, fruit & yogurt. A great value hostel in Krabi Town. Perfect if you like to stay somewhere quieter and travel to the beach. The family who run the hostel are lovely and so friendly. Can book trips and buses from reception. Free breakfast was great and beds were comfy with AC and curtains. Although I would recommend staying closer to Ao Nang beach where the main attractions are more accessible, this hostel was good. Staff very helpful with advice and directions to activities as well as providing a super speedy laundry service. Beds were comfy and lockers were provided. An overall good experience. In order to get to our dorm we had to walk up a floor that appeared to be the living quarters of the owners. It was very dirty and messy. The dorm itself was clean but the breakfast area and the bathrooms could've been cleaner. There isn't really an atmosphere to the hostel. Not a place to meet people. The breakfast was nice though, lots of fresh fruit. Also huge lockers to fit your backpack and curtains on the bed.